Can you only imagine what/how many were inside? ... the sight of them always gives me the chills... a reminder of three of them stuck in my hair when I was a young girl. That was a big one for sure. We do a perimeter check of the house and shed two or three times a season to make sure none are being started. Best to get them right away. That gave me a chill too! I react very quickly to stings and keep Benadryl on the shelf. I don't think I'd get close enough to check and make sure they were all gone - I hate those things. Yes, that was a big hive and sure glad it's vacant now. I'm glad it didn't fall around you when it was full! That wouldn't had been fun! Had to be a strong wind to blow that down! 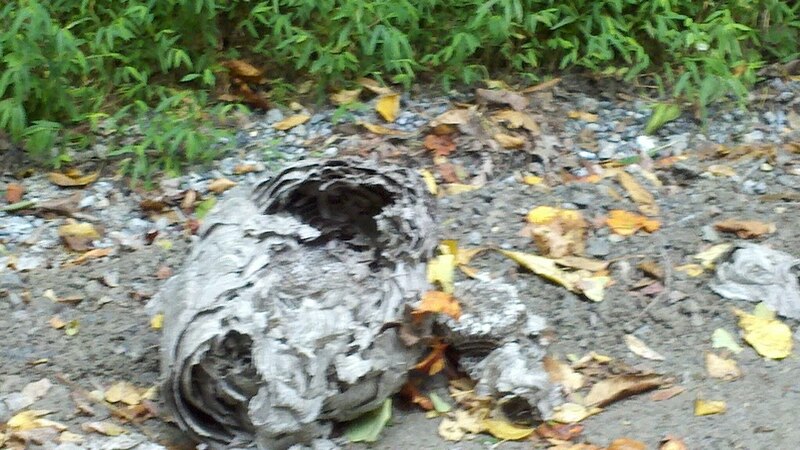 Here, we have paper hornets that build like that...much scarier than paper wasps.